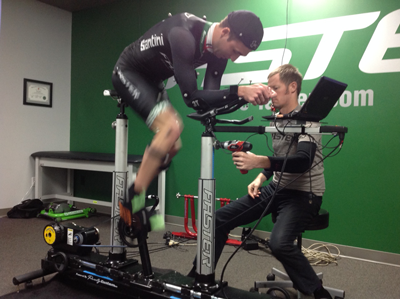 Over Thanksgiving break, I visited Ride Faster, a pro level bike shop in Scottsdale, AZ, for a 3D bike fitting. Having reached a major milestone in my career of USAT Elite status, my Dad said we should upgrade my bike, starting with a detailed analysis of the right geometry for my body and to improve my aerodynamics. Luckily, the bike shop named at the Interbike trade show in Las Vegas as having the best pro level support in the US is located in my hometown: Ride Faster. I had been on size cycles in the past, for conventional fittings. These are made to look like a virtual bike, with handlebars, a saddle, a crankset and pedals. The frame is all adjustable parts with threading to move them around relative to one another, simulating the geometry of the ideal frame for the rider, or to test fit the geometry of a particular bike frame before ordering it. One of the most familiar size cycles is made by Serotta, a custom frame maker. They certify their dealers at the Serotta International Cycling Institute in its use to help order their custom frames and to ensure customer satisfaction with a good fit. At Ride Faster, fitting guru Aaron Ross uses the Next Generation Serotta Size Cycle. In addition to the basic size cycle approach, he adds 3D functionality by placing 10 infrared cameras around the room, and having the rider don a speed suit with sensors at all critical joints and body parts. These will be picked up by the infrared cameras and plotted dynamically in 3 dimensions on a computer display. As the component parts are moved, the affect on the rider’s motion is immediately revealed on the display in real time. At the beginning of the session we just talked a lot about how I ride and what my goals were. I told Aaron I knew is was not very good aerodynamically, especially with a high upper torso position. Aaron explained that there are basically two different positions available on a tri bike. Position A, with the pelvis rotated back, vs Position B, with the pelvis roared forward. “A” tends to create an arched back, higher torso, and more drag. “B” opens the torso/legs angle, improves leverage, and flattens the back, reducing drag. If you can get comfortable in B, it is preferable. We discussed how this choice affects leverage, work efficiency and drag. The choice of position dictates saddle type. Position B allows a narrower Q factor (width between the feet). Aaron proceeded with a physical exam. He looked at my foot pronation and rotation, knee alignment, hip alignment, flexibility, joint movement, and leg length discrepancy. He said I had no leg length discrepancy and good hip flexibility, giving more options for the feet. Once my avatar was established by the cameras and computer, I got on the bike and we began tacking my movement as I pedaled. We observed excessive hip movement, and excessive upper torso drag. Aaron said he wants a tight figure eight pattern looking at the outside of the hips from the side. He said I was using Position A, that my knees were turned way in, my path of knee travel was not aligned strictly vertical. I had some looping on the right and an S-shape on the left. Some left foot prolapse affected my knee and hip travel. Aaron isolated on each avatar dot to show movement isolated to certain points. Hip and body movement came first. Aaron started with quieting my hip movement. That fix would begin to correct the other extremities. The size cycle was set at my current bike’s dimensions. Right away, Aaron said my saddle height was too low. Aaron raised the saddle, and showed me how to get into Position B, with my hips rotated forward. He recommended changing crank arm length to 170mm, down from 175, to increase cadence for energy system management. As we moved along, I learned to get the elbow pads more directly under my upper arm, to rest on my bone structure, rather than further from the elbow, where much more muscle tension results. As these adjustments were made, I noticed how much easier it was to keep my head down. I laughed and said how much easier and more relaxed the new Position B felt. Aaron had to tell him me stop already and get off the bike. It felt so good, I didn’t want to stop! Aaron, with lots of wind tunnel experience, stated that this change in position would save 2-3 seconds per kilometer just in drag reduction, not including the energy management savings. Given that a Half Ironman has 90 kilometers of cycling, that is a time difference of 3 to 4 1/2 minutes from the drag savings alone. That’s 5 place points up the finish order at Austin 70.3, from 18th to 13th, and leaving me set for a better run split form less energy used. Aaron added stiff insoles to my shoes, including a slight shimming effect to neutralize my knee alignment. My pedal cleats were also adjusted to narrow my stance and improve alignment. All these adjustments showed up with improvements (before vs after) on the video screen as we isolated on those data points. I felt much better, smoother, more relaxed and “quiet” on the bike with each of these changes. Aaron used a cordless drill to make rapid adjustments in saddle height, bar height, seat tube angle, and reach, all dynamically while I was pedaling. With each change, while watching on screen, I gave feedback on what Aaron was changing, In this manner, each setting was dialed into a sweet spot that Aaron had already anticipated, but was verified with my dynamic testing. Comparing the resulting idealized geometry from where we stopped, we were able to confirm that the top frames from Cervelo and Ventum fit me very well. Aaron expects to start me around a 78 degree effective seat tube angle, and with time in the saddle, getting that up to the low 80’s. The Dimond medium (56) is a little too short and low on stack and reach, has limited hydration options, and is not suitable for use on a trainer. Ventum’s 56cm frame turns out to be just right for me, with fantastic, integrated aerodynamic hydration, and a really stiff drive train for efficient pedaling. As I get onto a new bike, my reach will start at one point, and then grow a bit as I adapt to the new riding position. The reach, stack, elbow with and hand position settings will be finalized in the Ride Faster wind tunnel once we get the other settings dialed into the new bike.